We offer a luxurious chauffeur-driven service in a modern E-class Mercedes to USAF personnel, businesses and individuals in the Mildenhall and Lakenheath areas. Our suited drivers are mature, professional and helpful and our chauffeur service is strictly reliable - a factor that is very important for both corporate meetings and travel connections. 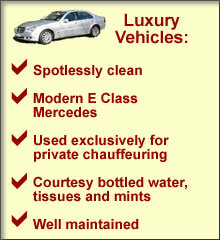 See our corporate chauffeuring and travel destination chauffeuring pages for more information. Our Mercedes are individually valeted before each new customer and used exclusively for chauffeur services - they will not have been used for a hen party the night before! Please see our home page for further information. For USAF personnel at the Mildenhall and Lakenheath airbases, for companies in Mildenhall's industrial estate and for other businesses based in and around Mildenhall and Lakenheath, we offer a luxury chauffeur service to both business meetings and to airports/seaports/railway stations. We also provide a high-quality chauffeur service to corporate dinners or events. We offer a highly reliable, very comfortable, chauffeur-driver airport transfer from Mildenhall and Lakenheath to all London and UK airports. See our airport transfer page for more information. Hire a private, chauffeur driven Mercedes for travel to and from the Mildenhall and Lakenheath areas; airport transfers to London airports and other UK airports.